UK Bacardi Legacy champion Leon Back, of Panda & Sons bar in Edinburgh believes Scotland deserves more than one heat to qualify for UK finals of the competition. 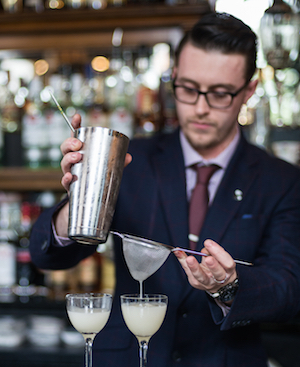 This is the third consecutive year that Back has entered the competition and after being crowned UK champion at the northern European finals in Amsterdam, he will now join more than 30 other bartenders at the global finals in Mexico next May. More than 30 bartenders represent different countries at the global finals, which are held in a different city each year. Last year’s Bacardi Legacy champion, Ran van Ongevalle from Belgium has spent the past six months travelling around the world acting as an ambassador for the brand and his Clarita cocktail has been hosted on menus globally. Back continued: “It’s my third crack at it so it’s become a big part of my life it’s amazing to finally get this far. “Mexico has been on my bucket list of places to go for a long time so I’m really excited. Even in Amsterdam the networking opportunities were amazing and that’s a fraction on what Mexico will be like. Shake all ingredients with ice, double strain and serve straight up in a Nick & Nora Glass. Spray with a spritz of Islay whisky on the side of and top of glass.